THESE SOFT FAUX LEATHER EYEGLASS POUCHES ARE SPACE SAVERS & FASHIONABLE! If you have been searching for eyeglass holders that are not big and bulky, and can easily fit into your evening bag or pocket, then look no further! OptiPlix has designed an eyeglass pouch with your needs in mind! At OptiPlix we believe in creating fashion accessories for your personal items that only add to your persona. That is why OptiPlix has created our stunning Sleek PVC Pocket Style Eyeglasses Holder. You can rest assured that it will be a breeze placing this pouch wherever you'd like! Is your handbag jam packed? Are your pockets crammed? Do you always lack shelf space? No problem! Our stylish and functional eyeglass pouch is compact, giving you the ability to store your eyewear wherever is within reach! The holder features a simple cut-out top which allows you to easily slip your glasses in and out without ever having to remove the entire pouch from your pocket! In addition, this case can be stored in your car, office, bedroom nightstand, or wherever you like without causing a mess. 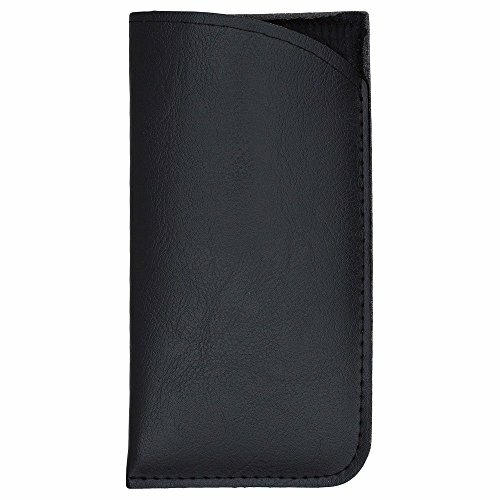 Its slim design makes it the ideal space saving way to protect your eyewear! These shiny eyeglass holders have a faux leather look and are fully lined with very soft material to completely protect and store your glasses. They are available in the neutral colors of black and brown, and may be purchased as a 1 Pack, 2 Pack, 3 Pack or 4 Pack. These pouches can also be used for additional purposes such as storing jewelry, electronics, stationery, and more! COMPACT AND LIGHTWEIGHT: These faux leather glasses sleeves are very lightweight so that they will not weigh your bag down. Their sleek design also allows them to be stored anywhere, so you never have a hard time putting them away. 1PK, 2PK, 3PK OR 4PK: At OptiPlix we have decided to provide you with the option to buy not just one, but a two, three or four pack of these eyewear cases. It's common to misplace these cases so the more you have the better. FITS MOST STANDARD SIZES: Our eyeglasses holder is manufactured in such a way that it can fit most standard sized glasses and sunglasses as well. These pouches are great to hold eyewear for men, women, and children! MODERN DESIGN: Our stylish Pocket Style glasses holders cases are available in the timeless colors of the Black and Brown. These holders easily add a subtle touch of style to your outfit without you even trying! MULTIPURPOSE USE: You can use these holders for more than just holding your shades! These cases case can be used to store credit cards and IDs when a purse won't do. You can also cleverly store your smartphone, jewelry, money, and more!